The bright pink sunset at 5 outside my window. How pink glows off the buildings and the airplane leaves that white line of smoke in the middle of it. Brooksie’s new phrase “hereyago hereyago hereyago” when he’s handing something over, or asking for something filled or showing something important. Here you go, Mama. A Friday evening watching Liz take her oaths as an attorney. And getting to stare at all the proud parents in that room. Figuring out that I can make my homemade playdough smell like peppermint. Thanks Pinterest! Most of the time you make me feel inferior in every way. But sometimes, you come through in the clutch. A husband who, though he doesn’t thrive in handyman tasks, still works hard and builds some proper shelves when called upon. He did good. A successful St. Nicholas celebration. It wouldn’t be a spiritual family activity if somebody didn’t whine, “This is so boring!” and it didn’t take three times as long to get to the Food Bank as we planned on, thereby resulting in somebody’s nap not quite working out. Yes, my family spiritual practices are imperfect. Also, Brooksie is singing at all times these days. And I can’t take how sweet it is. We have a “Silent Night” picture book that is just the words to the song so I sing it every time we read it. He keeps pulling it out and nasaly singing: “Ahh ehh ahh, sahh neh sah” over and over. It’s not possible that anything is cuter in the world. 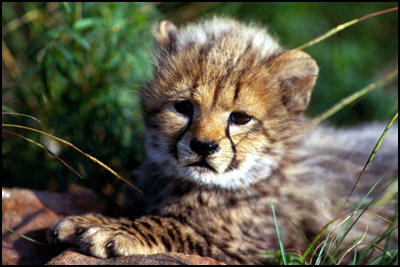 Just try and convince me that a baby cheetah is cuter. I’m drawing a line here: Cutest. Thing. Ever. August making a menorah out of clay at his little Jewish preschool. It's all wobbly and only capable of holding around four candles. I have no idea what to do with a menorah but August begged to light it and we did. And we talked about God keeping his promises. It was kind of sweet. This article from Kristen Howerton listing so many amazing ways to give wholegifts this season. Speaking of, this Christmas I’m giving some family members (who shall not be named!) some beautiful pieces from Hill Country Hill Tribers, an Etsy store run by a group of Burmese refugees living in the Austin area. I love their work and I wholeheartedly recommend. It’s happening! Christmas is showing up soon! I’m thankful. What about you? What’s on your list today? Link up or list up in the comments.